JLG Financial – LEAF Commercial Capital, Inc. Need to finance an equipment purchase but aren’t sure where to go? 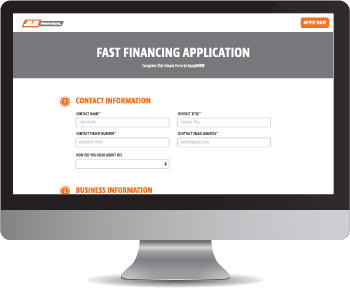 JLG, the global leader in AWP manufacturing, now offers easy, affordable financing for all equipment needs through JLG Financial. What type of equipment are you financing? JLG Financial, powered by LEAF, helps businesses get more from their budgets while they drive revenue with purchased equipment. Choose from a variety of flexible financing options to meet any need. New or used, all makes and models – we finance purchases of $3,000 or more with customized terms for better cash flow control and business agility. Submit the application with a quick call or text, and we’ll get back with a credit decision in as little as 2 hours. No matter which affordable option you choose, comfortable payments help keep more cash available for any business use. Terms and Conditions: LEAF finances equipment only for business purposes and not for personal, family or household use. All applications are subject to credit approval.